This tutorial is meant for those that would want to go more deep in customizing their template so just follow the steps carefully. Then Select your preferred blog which you will love to remove the home button in your dashboard. Now move your arrow down and Click "Template." 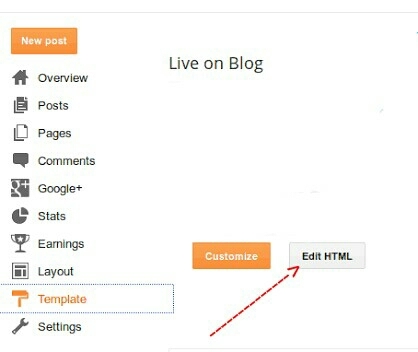 Click "Edit HTML" in the Live on Blog section. Now try to backup your template before editing it. Then Click to check the box next to "Expand Widget Templates." Click anywhere within the HTML code, then press "Ctrl-F" to open a search box. Enter the following text into the search box and press "Enter button. <a class='home-link' expr:href='data:blog.homepageUrl'><data:homeMsg/></a> This line of code will be highlighted in your blog's HTML. Then highlight the line above and delete it . Finally just Click on "Save Template button above. Now visit your blog and check it out. For instant updates you can subscribe to our news feed service using the box below thanks.